Anti-Israel MP all sour grapes in speech conceding defeat in last week's elections, but says he's not finished with politics. 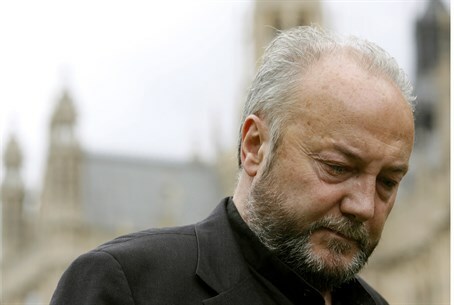 Notorious anti-Israel former MP George Galloway has no intention of stepping away from politics, despite being soundly defeated in last week's British elections. Not long after conceding defeat, Galloway - who heads the far-left Respect Party - said he would be standing for London's Mayoral elections in 2016. But in his valedictory speech on Friday he couldn't help but cast a dejected figure, congratulating his opponents while lamenting that "the racists" and "the Zionists" would be celebrating at his loss - despite the fact that he lost to a local Muslim woman. "It's obvious that the Labour Party will be celebrating here in Bradford this evening," Galloway began. "It's the more remarkable because it's been a disastrous night for the Labour Party as a whole." "But there will be others who are already celebrating. The venal and the vile; the racists and the Zionists will all be celebrating." In typical style, Galloway cast himself as a "lion" ("the hyena can dance on the lion's grave, but it can never be a lion") before signing off with the Arabic "wasalaamu aleikum." Labor's Naseem Shah thrashed a previously confident Galloway soundly in the polls, winning 19,977 votes to Galloway's mere 8,557.